There are sites on the net (I'll be nice, I won't name names) that want you to believe stupid, badly done digital manipulations are "real" vampire dental anatomy: "Blah, blah, look at the differences in types and tooth development, blah, blah..."
DON'T BUY IT FOR A MINUTE! It is too easy to create fake crap like this. 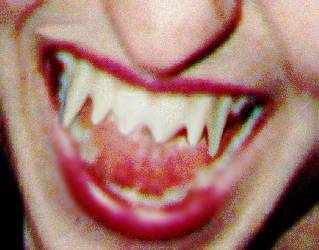 I didn't even use pictures taken wearing fake fangs. These are simple digital manipulations. I could have spent longer and made them even more realistic, but why bother? This demonstrates my point well enough. Wow. I must really be well on my way to "turning" Look at those fangs! Come on. And this is the kind of thing you want us to believe?? Preventing Tragedy: Safety, The Internet, and Vampires: A serious look at the dangers of trying to contact or meet "real" vampires online and in the digital realm.